The techniques anyone needs to learn to spin successfully are covered succinctly in this Storey BASICS book. From understanding the different options in spinning wheels to preparing the fiber, drafting methods, plying, winding off, and finishing, beginners will be pleased to discover how quickly they can master the craft. 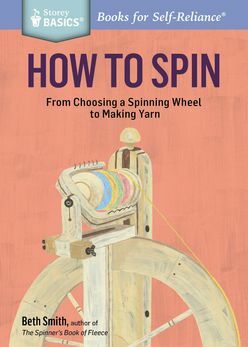 Expert Beth Smith teaches you everything you need to know to spin your own yarn, from choosing a spinning wheel to every stage of preparing your fibre, plying, winding off, and finishing. Fully illustrated step-by-step instructions make it simple and easy!